Hakusan, Japan, June 12, 2014 – EIZO Corporation (TSE: 6737) today announced the FORIS FS2434, a 23.8-inch gaming monitor with a slim 6 mm frame. 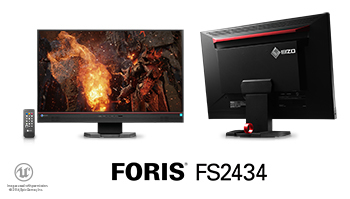 The FORIS FS2434 also offers vivid display of color and EIZO-developed “Smart” technologies for more enjoyable gaming. The monitor is ideal for RTS, MOBA, and MMORPG genres of PC gaming as well as console game genres of all types. Like previous FORIS FS monitors, the FORIS FS2434 is equipped with three of EIZO’s own Smart technologies to improve visibility and clarity. Smart Insight 2 – Available with the “Game” preset mode, this feature identifies dark areas of an image and increases brightness to make it simpler to spot enemies in the shadows. With the FORIS FS2434, Smart Insight 2 now also enhances saturation for greater contrast between characters in a game and the background. Smart Resolution – super-resolution technology that analyzes an image for noise and blurring and then corrects the blur without accentuating the noise. This feature is “Smart” because it adjusts only those areas where it is needed. Smart Detection – identifies where on the screen a video or game is being played and applies Smart Insight 2 or Smart Resolution. To ensure visual comfort while playing games over long stretches of gameplay, the LED backlight is controlled with a hybrid of DC (direct current) and high-frequency PWM (pulse-width modulation) for flicker-free viewing at all brightness levels. EIZO has simplified adjusting of the screen settings by including both a remote control and its own G-Ignition utility software (Windows 8, 7 and Vista compatible). G-Ignition software also lets users download gaming presets created by professional gamers from gaming.eizo.com or export their own customized color modes to other gamers who also own the FORIS FS2434. G-Ignition can be used to assign hot keys to turn the monitor’s power and mute on/off, as well as adjust the color mode and aspect ratio. Two HDMI and one DVI-D port provide connectivity with PCs, consoles, Blu-ray players and cameras. A USB 3.0 hub with one upstream and two downstream ports lets users connect to USB 3.0-compliant storage devices or connect their mouse and keyboard to the monitor. A line-out jack for connecting to external speakers and a headphone jack provides further functionality. An ergonomic stand allows for positioning the screen at an angle most comfortable for the user. The stand includes 60 mm of height adjustment, 25° of tilt and 344° of swivel. The monitor can also be mounted on a VESA-compatible stand. A handle on the backside makes it simple to carry the monitor to a gaming event. The FORIS FS2434 comes with seven preset modes making it ideal for other entertainment content in addition to gaming such as viewing videos, photos or the Web. The presets are Game (Dark Scene), Game (Light Scene), Cinema, Paper, Web/sRGB, and two user adjustable modes. Using the bundled G-Ignition software, any of the presets can be assigned to a game or other applications installed on the user’s computer. Power consumption is only 15 watts during typical operation and less than 0.5 watts in power save mode. The FORIS FS2434 will begin shipping in late June. Date of availability varies so please contact the EIZO subsidiary or distributor in your country for details.